I’ve been seeing quite a few articles defending Greg Schiano’s “coaching to the final whistle” when they dove at the knees of Giants line in the midst of a kneel-down during the last seconds of the game. It’s time you saw the other side of the story and why that play by the Bucs (at the instruction of Schiano) was one of the most Bush-League plays in the history of the NFL. I’m not going to throw around the fact that I played low-level Div. 1-AA football (back when they actually called it that) and a year of semi-pro (aka unpaid) football as something that should qualify me as an expert retired football star, because I’m not. I’m a broken-down never-was that got by in the game mostly because I loved to ram my head into others as hard as I could, and get rewarded for it. However, I want to at least give it context that I did play the game and still consider my perspective coming from the side of a player. What I will tell you is that Schiano can defend the play all he wants and tell us how he “plays to the whistle,” and how “if they caused a fumble it would be a different story,” but he is still dead wrong. The fact is that all he accomplished by doing that was put a [well-deserved] target on his players’ backs. He will get what is coming to him and unfortunately, the players will be the ones to bear the brunt of it. Herm Edwards’, Todd Haley’s, Eric Mangini’s, and yes, Greg Schiano’s of the coaching world. This is a guy who who snuck into the NFL by scheduling Rutgers against every Service Academy team and 1-AA (aka FCS) school he could find. It’s about time he was called out for what he is: a complete fraud. When the answer is yes, then I know how I feel about it. He was the king of spin, or coachspeak, as they say. All fluff with little substance. He once told a kid that if he quit the football team that he would probably end up quitting on his family later in life just like the kid’s father did to him. Quality stuff for a leader of men, right? The bottom line is that I played for coaches you would give your left nut for and do anything they asked, and I also played for the Schiano’s of the profession who try to brainwash you into thinking they invented the game itself and if you don’t buy-in, you’re a malcontent. We’ve just seen Billy Gillispie “resign” from Texas A&M hoops because he was the latter. It’s about damn time we eradicated these coaches from the ranks and stop looking at them as leaders of men. They’re not. Not all of them anyway. Back to the kneel-down play that originated my rant: I think this one is as black and white as they get. It’s a worthless cheap shot move and if Schiano’s players had any cojones they should have told him to get lost when he told them to do it. He is now going to get one of his players hurt for pulling that stunt, plain and simple. Football has a way of working these things out, between the lines. I promise you that this won’t be the last thing we see from it. As for the play itself (diving at the legs of lineman and trying to “steal” the snap): coaches in youth football stop teaching that bogus move right around the 4th grade. If you lose, you lose with dignity. There were three seconds left in the game and let’s just say the Bucs forced a fumble on the snap and then dove on the ball to recover it. They recover the fumble. Great, game over anyway. What’s the end goal here? Schiano knows damn well he had no expectations of causing a fumble. He was trying to make a statement to his team and the league that he doesn’t have any “quitters” on his team. Instead the only statement he made was that his team is now the joke of the NFL. They look like a bunch of kids playing in a man’s game. When a team is kneeling, they are conceding the play. 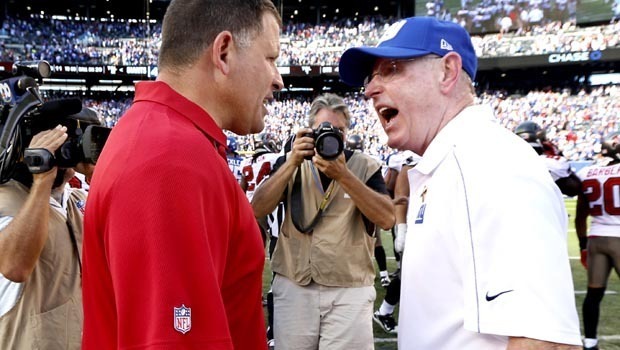 Schiano would have been the first one to the podium whining like a little girl if the G-Men ran a play action deep throw in that spot and scored a TD, wouldn’t he? It would be rubbing it in right? So when the other team decides to kneel on the ball and win with honor instead of shoving it down your throat, you accept it. Instead of turning your team into a bunch of bush-leaguers because you think you’re smarter than everyone else, how about getting them to give up less then 40 points in a game and you wont have to dive into the other team’s legs to cause a fumble with 3 seconds left? Seems like a better use of practice time, doesn’t it? I’m sick over this whole debate and what’s even worse is that there are too many media members rushing to Schiano’s defense. Take a close look at who they are though, and aside from Ditka, most of the supporters are guys who are on a soapbox and fit too closely to that mold of blowhard. If any of those defenders of the play thought it was such a great call, why didn’t any of them do it (or call for it) during their coaching and playing career? The worst part of the whole play and the scrutiny it is receiving is that it’s a small part of a larger problem. We have coaches becoming more and more powerful, making more and more money, and gaining more and more recognition. Right along with that exponential growth has been the coaches’ egos. We are at a point that is unprecedented in terms of scandals involving coaches. They seem to keep coming in droves: Payton, Paterno, Petrino, Tressel, Leach, and too many others to name. The play in the Bucs game is not even a blip on the radar when it comes to this list, but it is certainly a small part of a disturbing, growing trend. Perhaps the wisest of them all, sadly enough, is Jerry Jones, who recently said that the kneel-down should be banned altogether. Make them run a play. Here’s to that. Maybe then Schiano could have his guys “fighting to the whistle”. Although then he may need to worry about letting up another TD.